Seattle Seahawks fans have likely heard that rookie Malik McDowell suffered a concussion and facial lacerations as the result of an ATV injury a few weeks ago. Thankfully, reports indicated that he’s expected to fully recover and has already reported to Seahawks pre-season training camp. “Although not life-threatening, McDowell’s ATV injury highlights the dangers inherent in Yakima and elsewhere, in owning and riding an ATV,” according to Abeyta Nelson personal injury lawyer Greg Lighty. In Eastern Washington, riding ATVs, or all-terrain vehicles, is a favorite summer pastime. ATVs, also known as off-road vehicles, or ORVs, are what the Washington State Patrol refers to as non-street legal motorized vehicles, meant to be used off-road or on dirt roads, not on paved roads or highways. In Washington, drivers must be 13 years old to operate an ATV, or they must be under the direct supervision of a person 18 or older who has a valid driver’s license. According to Washington State ATV Association, all ATVs must be registered and have a title, and all owners must have a use permit. The ATV must also display a metal tag. ATVs can be thrilling to ride, but there are also major safety risks for ATV injury. ATVs can be unstable and hard to control, particularly at high speeds, and for that reason, we see many clients who have been affected by an ATV injury. If you decide to let your child ride an ATV, make sure he or she follows safety precautions and understands how to safely operate the vehicle. Safely operating an ATV requires the driver to make quick decisions, such as speeding up, slowing down, or shifting his or her weight in response to changes in the environment. Often weighing more than 800 pounds, ATVs have large, powerful engines that allow them to reach speeds of 50 mph or more. 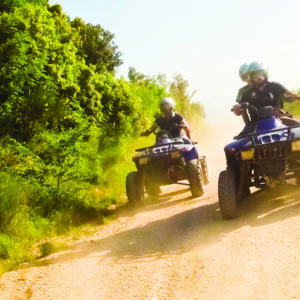 ATVs have a high center of gravity and usually don’t have roll bars, safety cages, or seatbelts, meaning they can tip easily, throw riders and passengers off, or even roll over on top of riders. This can cause injuries such as cuts, scrapes, broken collarbones, broken arms and legs, head injuries, or even death. Ride an ATV that’s right for your size and age. Always wear an approved helmet and eye protection. Wear long pants, long sleeves, gloves, and over-the-ankle boots to help prevent scrapes and cuts. Always ride at a safe speed on a designated ATV trail. Know basic first aid to treat minor injuries. Never ride on a three-wheel ATV. Never ride while drinking alcohol or using drugs. Never ride on paved surfaces or public roads. Never exceed the passenger limit allowed by the manufacturer. Never allow kids and teens to carry another passenger. ATV riding will always be risky, but because they’re fun, many kids and teens will want to try them. By making sure that riders follow safety precautions and know how to use ATVs safely, parents can do their best to help protect their children from an ATV injury in Yakima, and across Washington state. Finally, give our experienced attorneys at Abeyta Nelson Injury Law a call if you’d like to discuss an ATV injury with us.